Most of my 34th birthday shenanigans are done now, and it's been a lot of fun, mostly thanks to my dear fiancee Annelies. 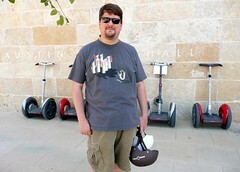 We started with a bang on Saturday with a segway tour of downtown Austin, taking our friend Kirk along with us. The tour company we chose is SegCity; they had us out for over two hours running around the city hall and capital area. The segways are a lot of fun to glide around in; you indicate your forward/backward motion based on how you shift your weight on your feet, and you turn using a handle twist on the left side. It was easy to do 360 degree turns, and getting around the ramp-filled downtown sidewalks was rarely a problem. The top speed on the units we had was 8MPH, so you were never going dangerously fast. After that, we attempted to get people to mini-golf at Peter Pan's, but it was just too hot. Annelies showed off her ironing skill by making a "Happy Birthday Unwired Ben" t-shirt since she wasn't able to get my name on the sign outside. So, we went early to Hula Hut and had delicious Polynesian/Tex-Mex food under air conditioning. Then a few of us went to the Dart Bowl for a game where we all proved that we're not the world's best bowlers. I didn't break 100 (so sad). My last big birthday activity was last night when Annelies took me to Wink Restaurant, downtown on Lamar. They improvised a delicious vegetarian tasting menu using lots of local produce, including some great potato gnocchi and a pleasingly contrasty cheese plate. There are a few pictures of Sunday's fun on the Flickr set linked to the photo.